Back in December, just two days before Christmas, the U.S. Department of Justice responded to an inquiry from the Illinois and New York lotteries as to whether selling tickets online would violate the Wire Act of 1961. PocketFives was one of the first sites to report on the historic DOJ interpretation, which said that the 1961 law applies to online sports betting only. This week, the Illinois Lottery capitalized on the ruling by launching online lottery sales, and whether internet poker and other games will be next is anyone’s guess. 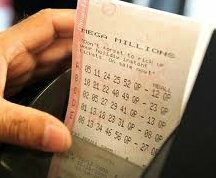 The children of Illinois scored big, as internet sales totaled over $15,000 on the first day, helped in part by the half-billion dollar Mega Millions jackpot that this author has already purchased multiple tickets for in advance of Friday’s drawing. Online lottery tickets went on sale in the Midwestern state on Sunday. According to an Associated Press article, “Lottery officials say they believe the pace of sales will be fast until Tuesday evening. That’s when the Mega Millions drawing takes place. The estimated jackpot is $356 million.” With no one claiming Tuesday’s Mega Millions grand prize, we’d expect sales to grow even more as Friday’s drawing nears. You’ll recall that the D.C. Lottery was poised to offer legal online poker games up until February, when the District’s City Council voted to repeal poker’s green light. Council members claimed in part that they didn’t realize they were allowing poker when the original language was added to a budget bill. 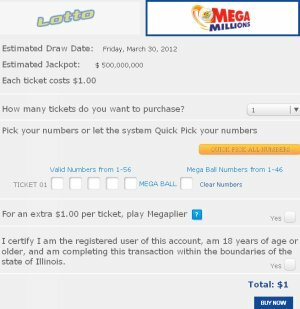 You can play Lottoand Mega Millions online through the Illinois Lottery’s website right now. There’s a big green “Play Online Now” button in the upper right that when clicked takes you to a Mega Millions online purchase page (pictured). All you have to do is select how many tickets you’d like, fill in your lucky numbers or select “Quick Pick,” and then choose whether you want to play the Megaplier. After verifying that you’re over 18 and situated in the state of Illinois, you hit “Buy Now” and you’re done. Just like in online poker, if a player wins through the Illinois online lottery system, their earnings are deposited into an online account: “Winnings of $600 or less are automatically deposited into your account. Winnings over $600 will be processed by the Illinois Lottery Claims department. You’ll receive an e-mail to notify them to complete the claim process.” You can also transfer your winnings to your bank account or elect to receive a Visa debit card for the amount won. Moreover, the Illinois Lottery offers online subscriptions that “allow you to set up one or more lottery wagers automatically for a set number of draws for a game.” The Lottery also runs Little Lotto and Powerball in addition to Mega Millions and Lotto, but online sales are not available for the former two games at this time. Stay tuned to PocketFives for the latest online poker headlines. Im from illinois but im not tryin to get lucky w random # picking. i just want my AA to hold up on a USA/Illinois Legalized site!! Prob will go buy a ticket tho since i dont have to leave the house. 4, 23, 28, 35, 7 are those the #s off Lost on abc i cant remember!? Poker Stars, welcome back to chicago. Heres the in, lets run with it. all the PPA/Pocket Five resources should be going towards getting online poker onto this lottery platform and website In Illinois. The door has been open in Illinois and we need to have our poker lobbyist and state reps that support online gaming to move on this FAST!!! Potential huge revenues for state and a huge stimulus to economy of Illinois as I guarantee many players move here to play and thus spend spend spend winnings!! !